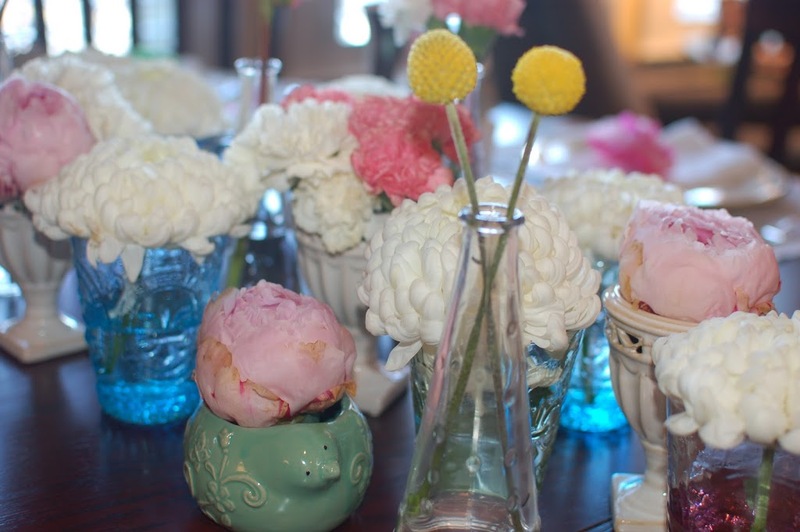 This Anthropologie-like bridal shower I styled last week was so much fun! There is tons of great inspiration out there for vintage flowers and decor. I was really pleased with how it turned out! In order to designate who the Bride was (as if anyone would NOT know!) I found these gorgeous, pre-made pennant letters from the Ruffled blog. Seriously, bookmark this link for your next party, it’s so easy! Print out the pre-made bunting letter to spell the word you want, and cut it out! 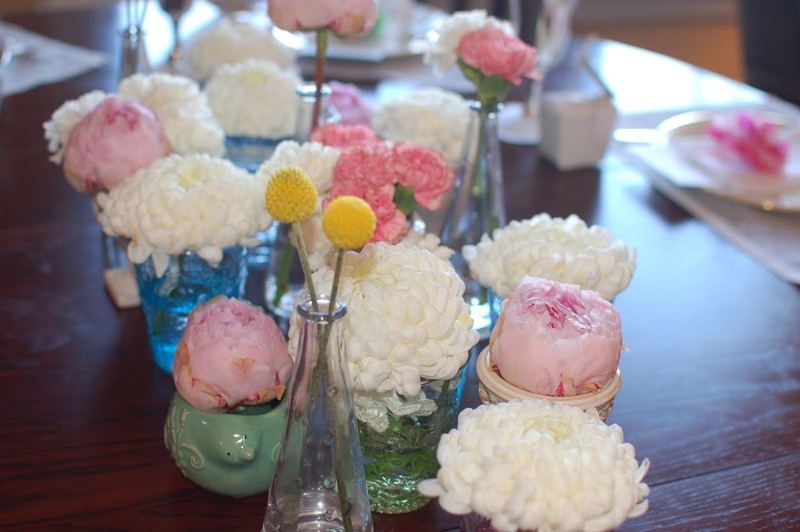 For flowers, I used a mix of pink/white carnations, white “football mums,” yellow Billy Balls and gorgeous pink peonies. 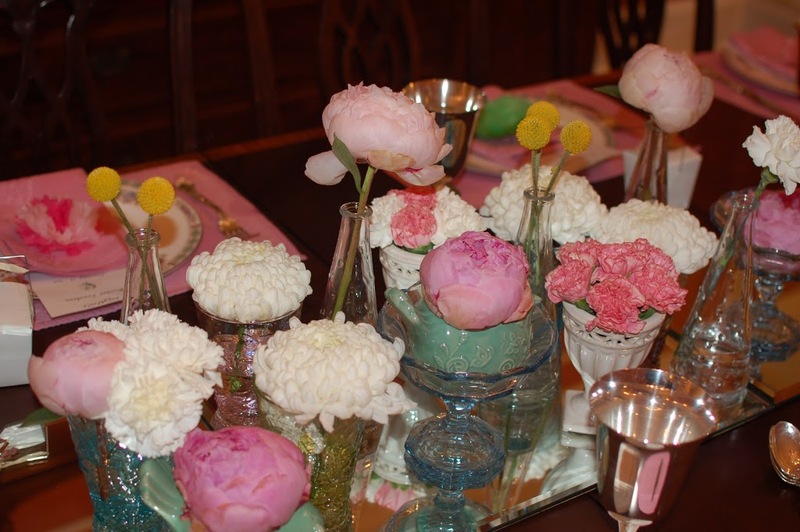 I clustered arrangements in the center of the tables for a pretty centerpiece! 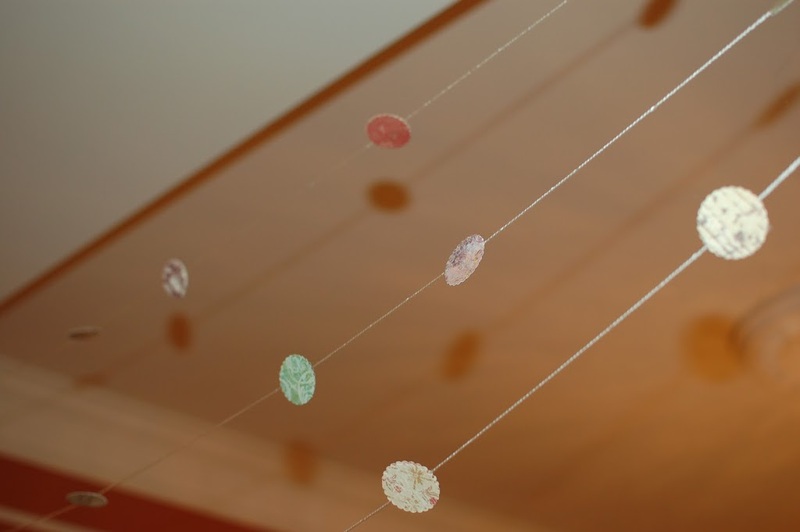 I created garland with a vintage vibe by using string and scrapbook paper. One of the best buys for a DIY event is a book of pretty scrapbook paper. It’s $14 bucks or so, and you get so much use out of it! My friend Hillary came over one day and we drank one and created garland. It was a good time – thanks Hill! I did 6 different strands. 3 between 2 columns in the entrance to the dining room, and three on the mirror on the back of the wall. I was definitely up on a ladder to get those suckers to stay on, and it turns out – I’m afraid of being on a ladder! Who knew. Another thing I learned? Very hard to take pictures of garland! Let’s take a view of the whole table now…there were actually 2 tables, so here they are! 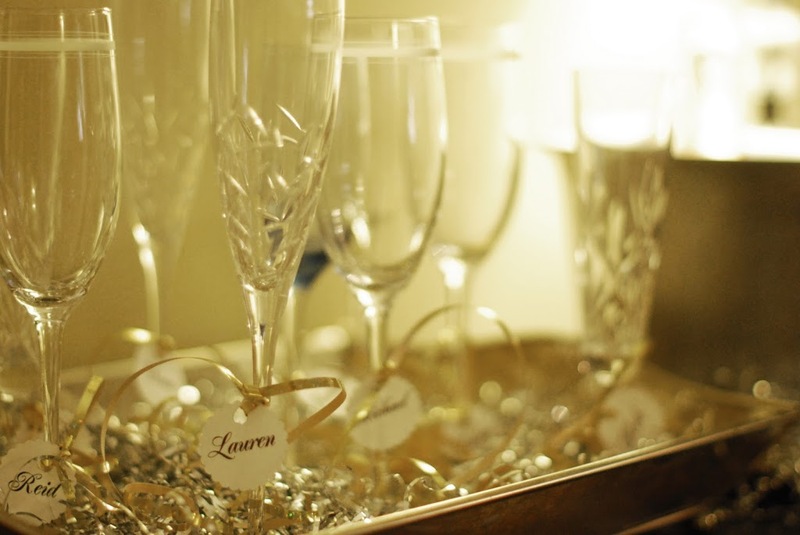 A champagne toast to the bride. Again, I used scrapbook paper to make pretty tags for the flutes! And finally, the all important topic of food. 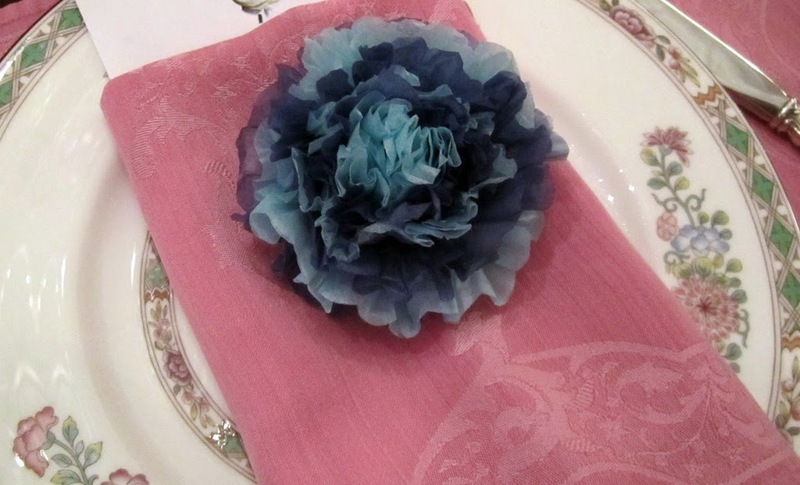 For a bridal luncheon, it needs to be light and girly … to put it plainly. I used Dean and Deluca catering, who always does a beautiful job. On the menu? Can you get more girly than that – the word tartlet just screams girly! 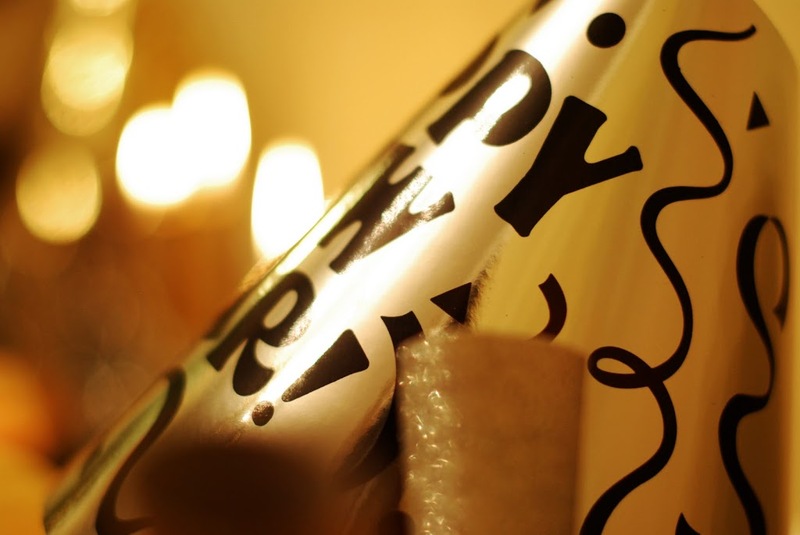 First and foremost – HAPPPPPPPY NEW YEAR! I finally took down my Christmas tree this weekend, which officially signals the end of the holiday season for me. It’s painful taking down the tree. I may have shed a tear or two. On the plus side, it’s always fun to watch Mr. Fo take the tree outside to the trash. Basically I laugh while he curses as he gets sap and pine needles all over himself and says this is the “last year we will get a real tree.” Oh Mr. Fo… as if you have any say in that decision. I run Christmas in this house…WORD! 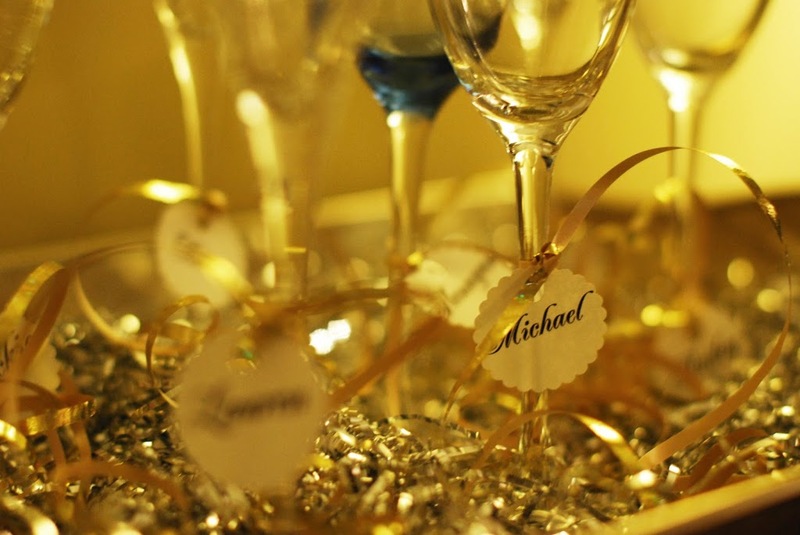 To ring in the New Year, we had a little soiree at our place before going out to dinner with friends. I think it’s safe to say that we are past the point of crazy New Year Eves (NERD ALERT), but I still like to celebrate with some friends, food and bubbly. After a quick trip to Party City and the Dollar Tree, I had a nice little gold, silver and black New Years Eve theme. 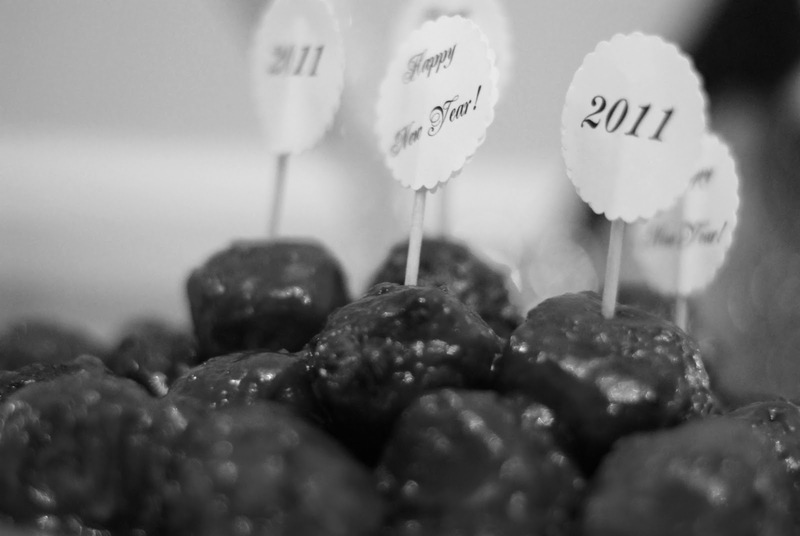 Take a look at the pictures of the party taken by my friend Flanagan. Thanks Flan! 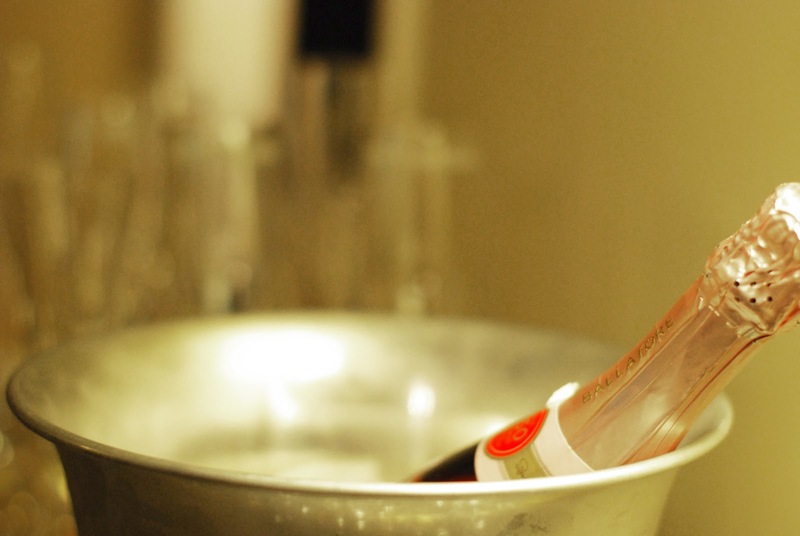 This NYE 2010 might as well have been brought to you by: Ballatore Spumante Rose. It’s my new favorite beverage. Why? 2) It’s a beautiful dark pink color. 3) Champagne is supposedly the lowest caloric alcoholic beverage…meaning you can eat more cheese and cupcakes at parties. I made a few light appetizers to tide us over until our New Years Eve dinner. On the menu? Cranberry-BBQ Meatballs – BBQ Sauce, Cranberry sauce and thawed meatballs done in the slow cooker! Caprese Salad – drizzled with olive oil, balsamic and lemon…use GOOD FRESH MOZZARELLA in water – it makes a difference! Serve with toasted crostini. Also served were mac and cheese bites, found on my blog HERE, and celery/carrot/ranch “shooters.” I chose these appetizers because they were all super easy and most involved assembly only, versus cookies. The apps I did have to cook I was able to prepare before. This is a great menu for a light spread that won’t leave you in the kitchen all night! I did create the Martha Stewart clock countdown cupcakes, as I mentioned HERE! It was pretty easy to do! I made pink champagne cupcakes with a white chocolate glaze. They were DELICIOUS. Mr. Fo wrote the numbers on the cupcake with black icing…he’s good at that kind of stuff 🙂 Check it out! 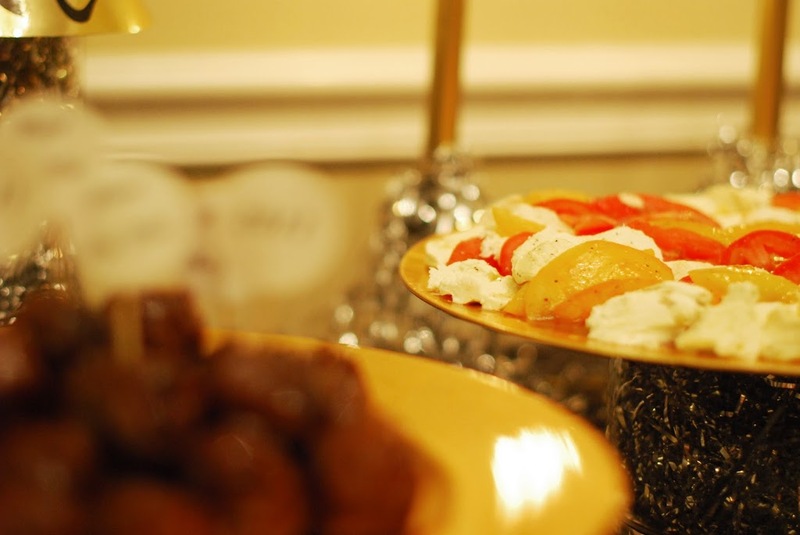 In this picture you can see how the food was served on raised gold chargers. Underneath the chargers were glass containers filled with the silver foil shred/tinsel. I got bags of it at the Dollar store, and it was worth every penny!